Juanes, the rugged-looking Colombian rockero who took first Latin America then the U.S. by storm, now appears to be doing the same in Europe, if his recent one-off London appearance can be submitted as any sort of proof. The March 8 Shepherd's Bush Empire concert sold out in less than an hour with the Evening Standard's subsequent review describing it as nothing short of a stellar performance. 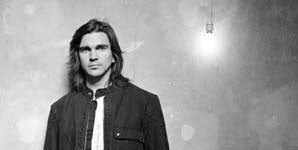 Juanes, born Juan Esteban Aristizabal in Medellin, Colombia, has indeed experienced large doses of success rather early in his career perhaps causing many casual observers to dismiss him as a soon-to-be passing fad. In fact, Juanes' success has steadily increased since the 2000 release of his first major label album, Fijate Bien (SonyBMG). He's also just as surprised at the speed at which he's gone from an unknown artist with a cassette demo in hand en route to Los Angeles to being named one of Time Magazines most influential people in 2005. "To be honest, it's been just as surprising to me. I am not sure as to how to explain it, but you can be sure that we're enjoying it. Completely," said Juanes recently in England readying to continue his European tour. The tour, in support of the European release of his multi-Grammy winning album Mi Sangre by Polydor, will consist of 19 shows throughout the continent. Interestingly enough, this very fame and recognition proved to be a key factor the singer/songwriter/guitarist's latest musical and philanthropic endeavor. Knowing full-well his own drawing power and understanding the relative ease with which his U.S. fans are able to purchase tickets to his concerts, he decided to put together benefit for a cause close to his heart: Helping the victims of anti-personnel mines in his native Columbia. It's a problem he feels does not receive enough attention. "Many people, including the media are not reporting on the seriousness of this problem in Colombia where an average of three people now die each day as a result of these deadly mines," said Juanes. Colombia has suffered three major periods of conflict over the past fifty years. The first, "la violencia," was a politically-based civil war, the second conflict was a 'war' against the Colombian state waged by the Medellin cartel and other drug traffickers. The third and so far seemingly the most dangerous consists of current insurgencies with most of the guerilla groups being known to use landmines as tool of terrorism against innocent civilians. To increase the visibility and credibility of the event, Juanes decided to ask some of his friends in the business to lend a hand. He specifically chose artists from various Latin countries to demonstrate the universality of the issue of land mines which is a problem throughout Latin America and virtually worldwide. The move also demonstrates further proof the barriers that once stood prominently between Latino groups continue to crumble. "I am really happy with the responses of my friends. It's great to for us to support each other on such important occasions like this and for such a meaningful and vital cause," said Juanes. The concert tabbed "Colombia Sin Minas (Colombia Without Mines) is scheduled for May 24 at the Gibson Universal Amphitheater in Los Angeles. Tickets for the all-acoustic show sold out in less than five hours. Juanes will be joined by other major players on world's Latin music scene: Alejandro Sanz (Spain), Ana Gabriel (Mexico), Carlos Vives (Colombia), Juan Luis Guerra (Dominican Republic), Laura Pausini (Italy), and Ricardo Montaner (Venezuela). Juanes' own Mi Sangre (My Blood) Foundation, producer of the concert, claims that in the last 15 years, 4,500 people in Colombia have died as a result of stepping on anti-personal mines. Many of the victims are children from the countryside. The mines are also responsible for permanently disabling over 1000 more people per year. With the number of annual victims continually increasing in recent several years, the figures of those killed and wounded already in 2006 show the likelihood of the most devastating years to date. Yet, it is the devastation, suffering, and resulting pain that Juanes points to as the direct inspiration for not only his compassion but also for a creativity he shares with many of his fellow countrymen who have also made an impact in the music industry like Latin Alternative pioneers Andrea Echeverri and her band Aterceopelados and the internationally famous Shakira among others. "It is because of those hardships we suffer in Colombia that most likely makes our hearts sing and dream. It's something we must do. We have no other choice."